I have heard from several different sources that vivid dreams are common during pregnancy. So it is sure to me that the clarity and realism of my partum dreams were not unique to me. Nor, I’m sure, was the nature of the dreams. Since my diagnosis of placenta previa, my dreams were in fact closer to nightmares. I would wake convinced that I was drowning in a pool of blood, unable to fall back asleep until I was sure of the baby’s movements inside my belly. I was not in the midst of one of these dreams, but rather awakened by the need to use the bathroom at 3 o’clock on a Saturday morning, when I stood up from my bed and felt the first gush of blood fill my underwear and drip onto the carpet. I reached the toilet, and only continued to lose blood. At first, I thought it was my baby that was seeping out of me, and the horror of it paralyzed me. In reality, my placenta had torn from my uterus. I was 28 weeks pregnant. I screamed out for my husband, and after waking our neighbors across the street to solicit them to watch our still-sleeping 18-month-old, we rushed past several state troopers and through even more red lights to the hospital. This was my second pregnancy. My husband and I had tried for nearly four years, and had gone through two surgeries and three cycles of in vitro fertilization before conceiving our first son. Now, after a fourth round of IVF we were expecting our second son. But he was coming too early. They were expecting me upon arrival, and I was immediately hooked up to the appropriate IVs. They gave me a few medications—to slow the contractions that I was having, to protect the baby’s brain and to boost his lung function, in case of premature delivery. The nurses and doctors were incredibly attentive. 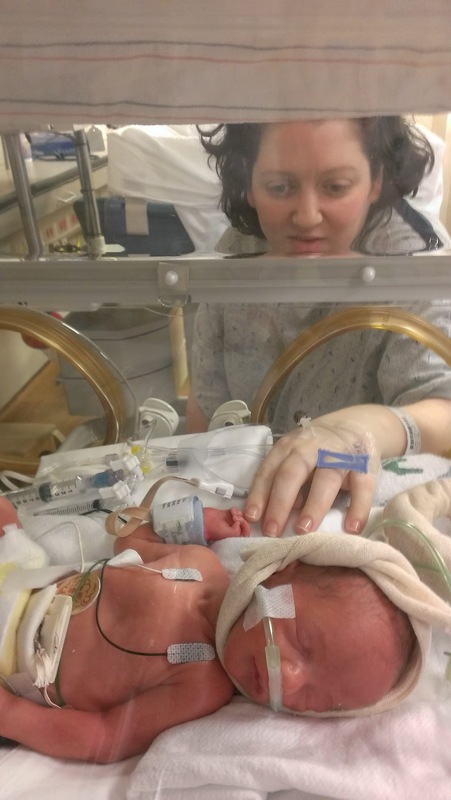 I spent the entire time worrying that my baby would be born too early, that he might not survive, and if he did, that he might have serious disabilities as a result. When the bleeding was finally under control, it seemed likely that they would hold me for three days, and then release me to full bed rest at home. It was at this point when my husband left to check on our son back at home. At around 3:35pm, 12 hours after arriving in the hospital and 15 minutes after my husband had left my side, I began once again hemorrhaging blood. They rushed me into an operating room for an immediate and emergency C-section and blood transfusion. In total, I had lost a third of my body’s blood. I begged the nurse to call my husband. “I need my husband,” I continued to call out, right up until the scalpel cut into me. Because of the urgency, they had to make the incision in my abdomen before they were able to get me under general anesthesia. “Stop!” I screamed. “Keep going!” the second doctor yelled to the first. I passed out moments later. When I woke up, I had a new baby. My second son. 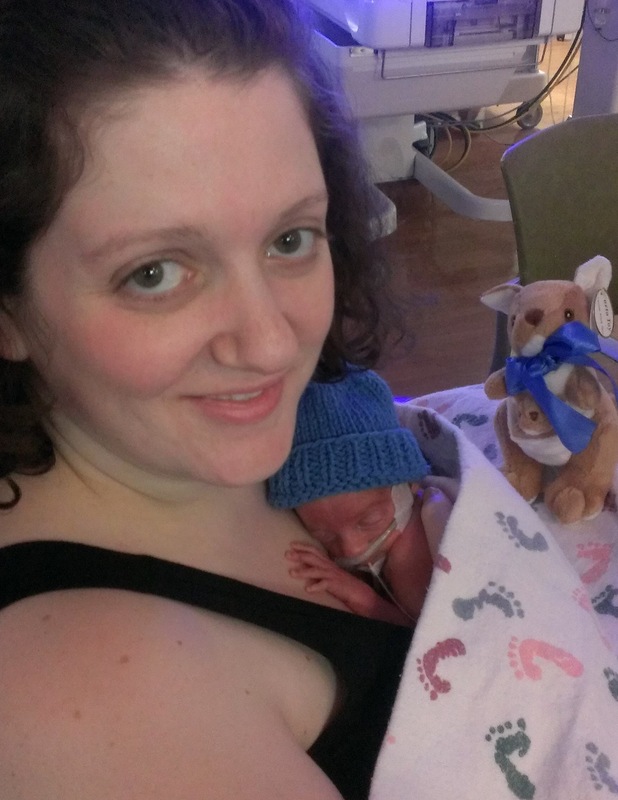 At three pounds, he was in the NICU. He was supposed to be inside of me, and for the first three days of his life, I wasn’t allowed to hold him. Then, after I was discharged from the hospital, every day, for several hours each day, I sat by his incubator. I couldn’t walk around with him. I couldn’t lie down on my bed and rest him on top of me. I couldn’t see him whenever I wanted, because I had another son at home, who also needed me. Who needed me more. So, I snuggled him against my skin, always in the same seat, unable to move too far from the machines attached to him by cords and wires. A nurse showed me how to bathe him properly. A nurse taught me what the numbers on the machines meant. Once the feeding tube was taken out, I fed him according to his schedule. For seven-and-a-half weeks, I was a visitor in my child’s life. A worried, scared, exhausted visitor, who went home at the end of the day to my husband and toddler son, without my baby. Those weeks seemed to never end, but, finally, they did. We brought him home on the eve of Passover. Our own Exodus from slavery. The acclimation was easier than we had expected, and life seemed as normal as it could be. Five months after he was born, we had a follow-up at the hospital’s high-risk clinic. He was doing great. No sign of the hernia. No anemia, no trouble eating, no problems breathing. He was gaining weight steadily. He passed his hearing and eye exams with flying colors. Sure, he was a few months delayed, but he would catch up, and otherwise, he was healthy. I took a huge sigh of relief, kissed my boys and thanked God. Then, out of nowhere, it all suddenly hit me at once. The inability to fall asleep. The nightmares when I finally did. The flashbacks when I was awake. The constant anxiety. I would find that whenever my mind wandered, it would be to whether or not I would be able to have another child, and if I did, would I be putting the baby and myself at risk? Then would come the “catastrophizing”—I started to picture what would happen—the bleeding, the screaming, the little baby on oxygen inside an incubator, a tube in his nose, wires attaching his tiny body to machines. The fear. Fear of dying, alone. Fear of my baby not surviving. It occurred to me fairly quickly that I was experiencing post-traumatic stress disorder. I had spent so many months with my mind on my boys—making sure that the baby was okay, making sure that my older son’s life remained uninterrupted. Now, for the first time in as long as I could remember, I was able to stop stressing, to stop worrying. I was able to breathe. But instead, the new focus on myself turned to restless nights and panicked days. Unlike my Biblical matriarch Rachel, I had not died. But I thought I was going to. I had experienced several related traumatic events: the first bleed, the anxiety-riddled stay in the hospital, the second bleed, the emergency C-section without medication, the trepidation of not having my husband with me and the seven-and-a-half weeks in the NICU. They all seemed to be conflated in my nightmares and my thoughts. Just as when I was pregnant, I would once again wake up in the middle of the night afraid that I was bleeding, that I would lose my baby, only to realize that my baby was across the hall in his crib. I didn’t remember the pain of the scalpel cutting into me, but I could vividly recall that I had felt the pain. Mostly, I recalled how terrified I was. The terror that was amplified by being utterly alone, and knowing that the baby was way too early. As far as PTSD goes, I imagine that mine was not very severe. I remained fully functional throughout, and I was able to overcome it with a few interventions. It had never occurred to me before, though, that child birth could cause post-traumatic stress. I was not a soldier in a war. I had not lived through a horrible attack. I merely gave birth. I know I’m not the only woman to experience trauma in childbirth, and I can’t be the only parent to face anxiety or worse as a result. I know that I am not alone, there is no shame in what I felt, and there is help for those who need it. I am a very self-aware woman. I knew what was wrong, and I knew to seek help. With minimal intervention of a new diet and exercise plan, melatonin at night, and an ear willing to listen, my PTSD only lasted for a few weeks. If you are experiencing postpartum PTSD, it’s not shameful, and it likely won’t go away on its own. Talk to someone. Whether it’s your best friend, spouse, mother, yoetzet halacha, doctor, rabbi, or someone with expert training, share your story with someone else. My story mimics Rachel’s in so many ways. She struggled with infertility for many years before becoming pregnant. She then gave birth to two sons. She had a traumatic labor and delivery. But, thanks to a leading team of nurses and doctors, and the post-Biblical birthing method of cesarean section, I survived. I have come to realize that survival comes in all shapes and sizes. Sometimes survivors wear tattoos on their arms, or uniforms on their bodies. Sometimes there is external damage that will never mend—a missing limb, a burned down house, a totaled car. Often, however the survival comes with a price, internal scarring that those around us cannot see. Maybe those scars will never disappear, but with the right help, they can fade. Mine have. Do I still catch myself occasionally catastrophizing, triggered by the terrifying thought of becoming pregnant again? Yes. But I can’t remember the last time I had a nightmare. Talia Liben Yarmush is a freelance writer who lives in New Jersey with her husband and two sons. You can find more of her work at www.taliayarmush.com. She is currently writing her first novel. Thank you, as always, for sharing your powerful words with us. Only strength to you and your boys! Jo – Thank you for reading my work, and for sharing your feedback. I really appreciate it! This is a very moving and powerful piece, and so important for people to know they are not alone. Thank you for sharing your story. Thank you, Hannah. It is definitely my hope that people will feel that they are not alone. For reasons that I think are obvious, many people don’t talk about their postpartum depression or ptsd, so when someone does feel comfortable talking about them, it’s important to share. As always, I respect, applaud, and appreciate your openness and honesty with your life. Aliza – Thank you so much! I always appreciate the feedback! What a powerful and intensely personal piece with an important message about seeking help when needed. It takes a lot of courage to publish this type of intimate story and share it with others. I wish you and your family only the best. Sarah – thank you for reading, and for replying. I really appreciate your thoughts! Talia’s masterfully-written story speaks to so many survivors of trauma – personal, military, physical or emotional. Thank you, Talia! Thank you, Susan, for reading and for taking the time to comment. I do hope that it will be helpful to others to see that they are not alone. Dealing with anxiety is freeing and sharing your story helps others do the same. Thank you, Elaine. I certainly hope so! Thank you for sharing. I wish I had had someone like you to share my story with so many years ago instead of just being told to “move on” after my traumatic birth when no one understood how devastating it was for me, which only contributed to my isolation. I told myself that after I physically healed, maybe the rest would take care of itself. But a few years later, when most of the physical healing had gone badly because doctors would not take my pain seriously and I was in need of physical therapy that doctors would not recognize. The emotional scars were still there. I still find it comes back to me when people who are supposed to be caretakers do not do their jobs or turn on me or when medical staff are less than caring (which happens all too often these days in the USA). I wish this would not happen to women. What gets someone through a trauma with fewer emotional scars are when humans behave in the most caring way. There is no excuse for that not happening in a hospital setting, especially right after the life-or-death emergency is resolved. Our emotional care is as important as the physical care. Thank you for the article. Shalom. I am so very moved by this account. As I read each and every comment (and each and every gracious response from you) I found myself struggling to say something that none of the above responses articulated. I cannot. All I can say is that you have been given a special gift for sharing your reality in a way that helps those of us who read your words–even males like me who will never come close to knowing what you have gone through–to be more self aware, more grateful for our blessings and more on the alert for opportunities that will come to us to use our talents to do what you have done, help others to live richer more meaningful lives. I can only imagine how proud of you your parents must be! Thank you for your story. This is what I’m experiencing. I had the first bleed, it was like a horror show, then the second followed by the emergency C section. I’m 8 weeks post partum and waiting to bleed out again. I constantly cry, afraid I’m going to hemmorage, although im in the “green zone” I can’t shake the feeling. Living like this is the worst thing that’s ever happened to me. I don’t know what to do anymore.